The targeted longer-term refinancing operations (TLTROs) that are to take place over the coming months will enhance the accommodative monetary policy stance. These operations will provide long-term funding at attractive terms and conditions over a period of up to four years for all banks that meet certain benchmarks applicable to their lending to the real economy. This should help to ease funding conditions further and stimulate credit provision to the real economy. In other words - nothing. Apart from lending money to banks in the hope they will lend it out, as if this hadn't been tried before and failed dismally. When will monetary authorities learn that throwing money at banks does not make them lend? The much-promised SME ABS programme, which might actually make a difference, is still only being talked about. There is nothing whatsoever here to indicate that inflation is going to head in any direction other than downwards. The M3 lending figures are still dire. Adjusted June figures are slightly better than those for April and May, but the fact is that lending to the private sector is still falling. The table doesn't show this, but lending to the public sector is also falling as fiscal authorities tighten their budgets. That is concurrent deleveraging by both the public and private sector at the same time, with no monetary easing by the ECB to offset it. "The increase in the MFI net external asset position, reflecting in part the continued interest of international investors in euro area assets, remained an important factor supporting annual M3 growth." If international investors pull their money - which if the Eurozone goes deeper into depression, or geopolitical risks centred on Ukraine worsen, they may well do - the whole thing could collapse. It seems the ECB prefers to rely on external investors to do its monetary easing for it, despite the fragility that such cross-border dependence creates for the financial system. I thought the ECB had a responsibility to ensure financial stability? The ECB's forecast of rising inflation over the medium-term seems critically to depend on banks. The thinking seems to be that the reason why lending figures are so awful is that banks are in a mess, so once banks have cleaned themselves up in order to pass the forthcoming stress tests they will start lending again, growth will return and inflation will start to rise. I fear this is magical thinking. The sort of lending that banks would need to do to restore growth across the whole Eurozone would soon put their balance sheets back in unacceptably risky territory. Are regulators really going to allow them to do this? Indeed, do we really want them to? The damage that is being done to the supply-side in many Eurozone countries in the name of "reform" raises credit risk and discourages lending. Repairing banks is not going to offset this. The fact is that companies in depressed countries are more likely to go bankrupt than companies in countries experiencing vibrant growth. Even a cleaned-up bank is not going to expand SME lending in a seemingly endless recession. They will lend in other countries that are doing better. See the fall in the solid black line from mid-2012 onwards? That's monetary tightening. There has been a whopping monetary contraction in the Eurozone for the last two years. No wonder it is not recovering. In fact, no wonder the depression is now widening out to engulf the core as well as the periphery. Far from offsetting the effect of painful fiscal consolidations imposed on Eurozone countries, the ECB's excessively tight monetary policy has made their suffering worse and delayed or prevented their return to growth. As market monetarists know, I am not a wholehearted believer in monetary offset, because I think monetary and fiscal policies have different distributional effects. In my view the Eurozone would still be suffering even if the ECB were doing monetary easing as other central banks have done. But making no attempt whatsoever to offset fiscal consolidation with monetary easing is simply disastrous. Hard-money ideology is driving the Eurozone into what Ambrose describes as "the most serious depression in Europe for 170 years" - far worse than the European Great Depression that led to the rise of Hitler. The only astonishing thing is that so far there has been so little public unrest. How on earth have the people of Europe become so docile? The ECB is not even achieving its mandate of price stability. It is a disaster. "The ECB is not even achieving its mandate of price stability. It is a disaster." Just to be clear, you do not consider 0.4% inflation rate to be price stability? "Price stability" in Eurospeak means "maintaining inflation at or close to the 2% target". 0.4% inflation is not by any stretch of the imagination "close to" 2%. Not it is not, but nor is it by any stretch of the imagination a failure at stable prices aka price stability. Motley Fool — you can't just define "price stability" the way you like. The ECB defines it as 2 percent inflation, so by its own definition it is failing. Hi, I've just done some number crunching on HICP data from Jan 2004 to Jan 2014 to get some purchasing power erosion statistics. By my calculations 1 Euro has declined to 83 centimes, 1 Pound Sterling has decline to 80 pence (not far behind!) but 1 US Dollar is only worth 64 cents. I'm surprised that the "Pound in my pocket" has held up so well. So over ten years the purchasing power of one euro is 29% greater than that of a dollar over the same period. I'm sorry but this matters to me, I like the Euro as a store of wealth. Your article seems to express frustration at lack of action, to some extent I sympathise. 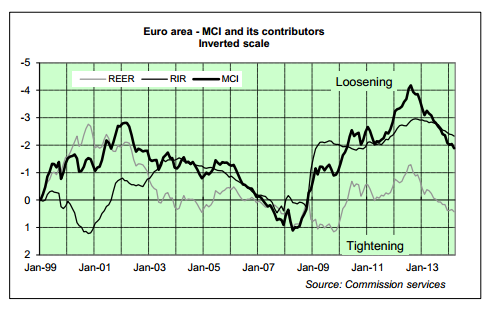 By the way your MCI diagram is interesting, but you should have highlighted that the problem is the REER real effective exchange rates' contribution to that statistic. ECB does not target FX rate for good reasons. But at last presser Draghi highlighted the divergent path of monetary policy in USA and Eurozone, he would like the FX markets to do his job and they may well oblige. Also Eurozone LTROs are unwinding, naturally, passively not like cliff edge in US monetary policy with their taper tantrums. I like the ECB, I like Germany, I like hard currencies. I like the fact that they have chosen NOT to print. I like the fact they have chosen not to bail out the borrowers and punish savers. You can see in the purchasing power stats I gave at the top that the USA has inflated away a good chunk of debt, well I guess as a reserve currency they can get away with it but I do not think you can read across to the ECB and expect them to so the same. Besides QE is illegal under EU treaties as you have written yourself elsewhere and I agree with you. Other than that, please continue to post. Great stuff and provocative too. Is "structural/supply side reform" a code word for magically making things better while the ECB does nothing? Otherwise what does it actually mean and how does it create jobs in the short term? It means destroying jobs in the short term, especially public sector ones, in the hope that this will create space for more to be created in the medium term. Which to be fair actually worked in UK (perhaps with a fair degree of luck) both under this coalition government and in Geoffrey Howe's Medium Term Financial Strategy despite 365 economists (inclusing Mervyn King) saying he was wrong . Thanks. I suspected something like that. I am puzzled by the focus on "creative destruction" (destroying things in the hope something else turns up) versus "destructive creation"
(Eg Amazon creates a new business, which as a side effect destroys some old ones). The problem with the world economy is not tight money. The problem is a lack of labor income. The decline of labor income was masked by increases in consumer debt and investment. Investment and consumer debt created demand where labor income could not. This is the economic structure of the last 30 years and it has exhausted itself. We need to determine how we can push more of the pie towards labor without damaging the structure of capitalism/democracy. The reliance on central banks is a diversion from the task at hand. Eurozone inflation is currently 0.4%. By no stretch of the imagination is that "close to" 2%. Let's face it the Eurozone is a land of unreality where the notion of there being a conflict between the phrases "fiat currency" and "government deficit" being linked together flies straight over the heads of the NeoCon "Stoned" Agers living there. Great article as usual Frances. Think it's important to point out though that QE enacted on Eurozone sovereign debt is *not* the same as QE in a typical sovereign currency issuing nation (which is, as you suggest, little more than an asset swap plus a placebo effect). So, where the Fed and Treasury are arms of the same body, that is not true of say the Portuguese Treasury and the ECB. Instead, with an ECB QE, you have a situation that is much closer to the Fed buying Muni debt rather than Treasury debt. Is the comparison with the 20s recession fair? Outside of outliers like Greece possibly, Europe has modern, wealthy economies which are much further away from subsistence production than then -- the bulk of production is leisure goods and services that may be nice to have but whose absence does not cause much real hardship -- and with overall passable safety nets. There are no empty shelves in shops, and few people are actually starving, and when they are it's usually because they fall through the safety net for non-economic reasons. Would a non-economist extra terrestrial visiting the continent in 2007, and then visiting again today, even notice there's been a recession? How on earth have the people of Europe become so docile? The disaster began with the creation of a even bigger 19th century UK banking union many decades ago. , not in 2008 - its therefore very wrong to start from the end of his bitter road. However the possible banking recovery seen in Ireland recently (chiefly through the mechanism of outside people with access to credit buying up conduit assets ) will be devastating for the local population as inflation of houses and the rest will make life impossible for many. Its very much like the irish banking crisis of the 1820s which some 20 years later led to a real physical life support crisis (famine) some 20 + years later. As today , the previous crisis was the simple result of the banking system scaling up even further causing larger and larger hinterlands to become ranch like areas for national and financial capitals. I should think by the ECBs standards its doing a fantastic job as these bankers reason for being is the destruction of all village like cooperation. Western Europe went through hell between 1914 and 1950. Europe is very deeply committed to unity and integration. Europe has shown that it is capable of remaining united in the face of monetary nonfeasance, misfeasance and malfeasance. Europe will take very high levels of pain before giving up on the unity project. How to explain? Here is my answer: in Europe there are only two schools of thought: marxism and austrianism. Either society progresses via redistribution, or via hard money, austerity and pain. The anglosaxon alternative--Friedmanite monetarism--is nonexistent. Even the socialists reject it in favor of hard money and fiscal restraint. Everything that the anglosaxons learned in the thirties and in the 2008-09 period is unknown in Europe. European monetary policy is in the Dark Ages of the gold standard. Consequently, the social polity will survive until it breaks, and it will break. You will have a repeat of what happened in the Thirties, involving both marxism and xenophobic fascism. We are seeing this already in central europe, and in the recent MEP election. Golden Dawn is Europe's future as long as the austrians run monetary policy at the ECB. Tragedy repeating itself. European central bankers should be sent to a monetarist re-education camp.